Wednesday was the first day of classes for the 2018-2019 School year. A young lady arrived in my classroom seeking information on how she might possibly join one of my music classes. She introduced herself as Elisabeth Lohi, a Grade 11 student from Finland who is passionate about playing the piano. After a brief conversation, I invited her to play for me. She accepted immediately and seated herself at one of our grand pianos. It took only a moment for me to realize that she is not only passionate, but truly gifted as well. I asked her if I could record her for our first musical feature of the Headmaster’s Weekly E-Newsletter. She smiled and said, "Yes, of course." Remember, this talented young lady is in a new country, culture, and school. I am told that there are many new students who are attending King's-Edgehill School this year but, I am sure you will agree, that Elisabeth has set the bar high on her first day! Click here for her performance. 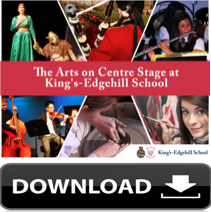 If you are a dancer, a singer, a musician, an actor, and/or an artist, then King’s-Edgehill School is the place for you.